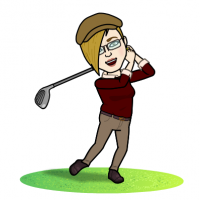 Discussion Golfication--AI comes to golf. Maybe. Golfication--AI comes to golf. Maybe. Anyone tried this attempt at bringing ai to golf? Bought it for fun last summer off a kickstarter--like app. Has a small square that clips on the back of a glove, then has plugs to put into grips at the end of the club. Has a UBS connection to a computer for loading data post-round, and there's an app that analyzes the data. Have not had a chance to use it as I'm stuck in the northeast. System doesn't require a phone on the course or tagging, both of which are good. Looks like it will operate in a practice mode, which means maybe I can use it indoors. Has no screen and no GPS. Supposedly gives all sorts of metrics. Will report on it when I get it up and going. Huh. I hadn't heard of this. Looks like a small outfit out of India. It looks similar to Shotscope, except that it uses the module on the back of glove, rather than a watch. A little to be desired as far as the polish on their marketing, but it actually looks pretty solid. It has more bells and whistles than other competitors (swing analyzer, AR view of course, and a 'simulated' AI competitor). It also has what appears to be 'true' strokes gained stats (Broadie), rather than the 'pseudo' strokes gained that Arccos and Shotscope use. If any of the additional features are halfway functional and if they refine their marketing a bit ('Golfication X' sounds a bit silly to me, tbh), could have legs in the space as it does quite a bit. I’m waiting on mine, but early reviews on their Facebook group haven’t been all that promising. Lots of glitches, but they seem fairly good with responding and fixing issues with firmware updates. Feels like they pushed it out a bit early without sufficient testing, but we’ll see how they develop. Just a warning. The app looks cool and maybe someday it will be a great system. For now, it's useless because I can't synch the plugs in the club ends to the app. And so far my e-mail inquiry to the company has gone unanswered. Not good signs. I am still waiting for my order (bought 2)...we'll see if they've been able to make software and firmware strides by the time I receive them, but results from the Facebook group have been lackluster.